Writer Stephen King is no stranger to the anti-drug tract. 'The Shining' is the story of a writer who takes so many drugs that he goes crazy and starts attacking his family in a fit of reefer madness. Likewise, the 'hero' of 'The Mist' is an artist, another of the group King implicitly criticises in his writing for being unable to stop taking drugs. The film begins when a mysterious mist rolls across the land. Of course, careful watchers who are engaged with politics know exactly what is happening: the film is set on the day that marijuana is legalised. Everyone smoking it at once causes a scary drug-laced mist to thunder across the land, sweeping up innocent people in its evil tendrils. Chaos soon reigns. Characters trapped inside the store begin to have drug-induced hallucinations, believing an invasion of harmless midges to be giant monster flies, and a hosepipe to be a spiked tentacle. Indeed, every death that occurs in the movie is down to the human element, from the poor man who is trapped under a faulty sliding door to everyone beaten to death with flaming mops as the midges buzz about the screen. Is it any coincidence that when the characters enter the pharmacy next door they see a scene of carnage (and then run away screaming from a spider)? Those in the pharmacy, high on marijuana fumes, had clearly raided the store for even more drugs and so destroyed themselves in their overmedicated state, King giving a biting critique of today's drug culture. Eventually our hero escapes, but he is so high on drugs that despite having got free, he takes out a gun and shoots his son, girlfriend and two innocent old people. The army then arrives to arrest him for his drug-induced crimes, King showing us how society will not tolerate such excesses. Now the nightmare is coming true. America is legalising marijuana as we speak: will King's vision of the future come true? 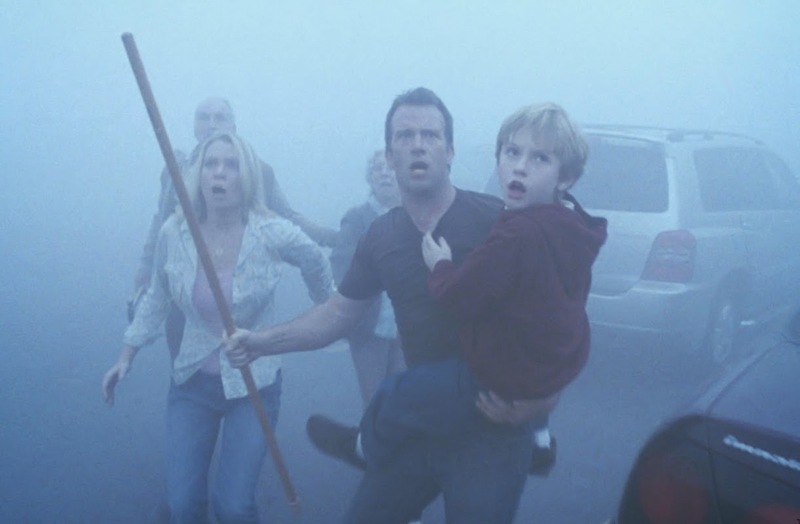 Will the mist roll across America for real? One thing is clear: the real monsters are humans. Humans fuelled with reefer madness.